Dr. Tamer Mansour is a pleasant and dedicated Ophthalmologist, who is subspecialized in Oculoplastics, serving the Washington D.C. community since 2011. He attended Howard University for both his medical degree and Ophthalmology residency. He then pursued his Oculoplastics fellowship at the renowned University of Pennsylvania’s Scheie Eye Institute, followed by an additional year of further training overseas. Dr. Mansour is an Assistant Clinical Professor of Ophthalmology at George Washington University where he received the “Teacher of the Year” award in 2013. In addition, he is the International Medical Mission Director at GW and has served in countries such as Egypt, Ethiopia, and Ecuador. Dr. Mansour also serves as the Oculoplastics Director at the Veterans Affairs Medical Center in Martinsburg, West Virginia supervising GW Ophthalmology residents and teaches residents from three programs at the Washington, D.C. Veterans hospital. Dr. Mansour is board certified by the American Board of Ophthalmology. He is also a member of the prestigious American Society of Plastic and Reconstructive Surgery (ASOPRS) which requires completion of an additional rigorous set of written and oral board examinations. Dr. Mansour sees patients for general eye conditions, trauma, and Oculoplastic consultations which include concerns about droopy eyelids, excessive eyelid skin, tearing problems, eyelid lesions/masses, facial palsy problems leading to inability to close eyelids, twitching of eyelids/face, problems of the orbit, and cosmetic issues such as wrinkles around the eyes and deep facial grooves requiring botox and/or fillers. 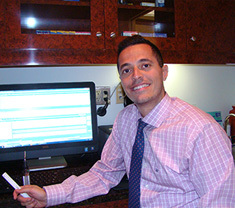 Dr. Mansour is sensitive to the uniqueness of each patient’s situation and adapts his consultations and treatment options appropriately to accommodate individual needs and concerns. Dr. Mansour loves to play squash and soccer in his spare time. He also has a special interest for architecture and art. He enjoys traveling and learning about different cultures.